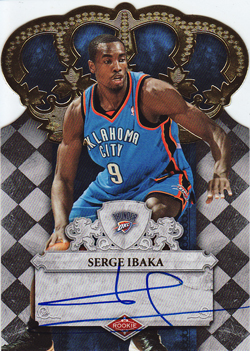 Serge Ibaka's career high performance in the Eastern Conference Finals last night, no doubt had a number of collectors, scrambling around trying to remember which of his cards they had in their collection. His perfect 11-for-11 shooting from the field in the first half of Game 4 of the Thunder's playoff series against the Spurs; set the Thunder on the road to victory, before one Kevin Durrant closed matters out in what is becoming his usual inimitable manner. Whilst, the Congolese forward is someone is renowned for his defensive abilities, having ended the season as NBA blocks leader and finding himself on the All-Defensive team for the first time, last nights performance was clearly his standout offensive game since he arrived in the league three years ago. Judging by the listings that have appeared on eBay over the last 24 hours, the value of his cards are going to rise a little. If he keeps hitting the outside-jump shot as he did last night, then the price rise may well be more permanent. I think I will hold onto the 2009-10 Crown Royale RC (that I pulled from a box when the product was first released) and see what happens for the remainder of the season.